Ingredients: Water(Aqua/Eau) Cylcopentasiloxane, Dimethicone, Glycerin, Citrus Aurantium Amara (Bitter Orange) Flower Water, Dipropylene Glycol, Sodium Hyaluronate, Isostearyl Palmitate, Polysilicone-11, Glyceryl Stearate, PEG-10 Dimethicone, Methyl Gluceth-20, PEG-100 Stearate, Acacia Senegal Gum, Chrysanthemum Indicum Callus Culture Extract, Isohexadecane, Propanediol, Stearoxymethicone/Dimethicone, Copolymer, Butylene Glycol, Niacinamide, Adenosine , Arginine, Allantoin, Glucosamine HCL, Tocopheryl Acetate, Beta-Glucan, Squalane, Ceramide, Phytosterols, Palmitoyl Oligopeptide, Palmitoyl Tetrapeptide-7,Sh-Polypeptide-7 Jojoba Wax PEG-120 Esters, Potassium Sorbate, Hydrolyzed Pea Protein, Hydrolyzed Wheat Protein, Butyrospermum Pakii (Shea Butter), Dipotassium Glycyrrhizate, Achillea Millefolumim Extract, Bambusa Vulgaris Stem/Leaf Extract, Chamomilla Recutita (Matricaria) Flower Extract, Foeniculum Vulgare (Fennel) Fruit Extract Fraxinus Excelsior Bark Extract Humulus Lupulus (Hops) Extract Melissa Officinalis Leaf Extract, Pisum Sativum (Pea) Extract, Viscum Album (Mistletoe) Leaf Extract, Vitis Vinifera Cell Culture Extract, Malus Domestica Fruit Cell Culture, Lecithin, Urea, Caprylyl Glycol, Olea Europaea (Olive) Fruit Oil, Isomalt, Colloidal Platinum Polysorbate 20, Polysorbate 60, PEG-40 Hydrogenated Castor Oil, PPG-26 Buteth-26, Silanetriol,Titanium Dioxide, Mica, Hydrolyzed Rhizobian Gum, Carbomer, Xanthan Gum, Hydroxyethyl Acrylate/Sodium Acryloyldimethyl Taurate Copolymer Ammonium Polyacryloyldimethyl Taurate, Alcohol, Potassium Citrate, Sodium Benzoate, Sodium Chloride, Sodium Phosphate, EDTA Phenoxyethanol. 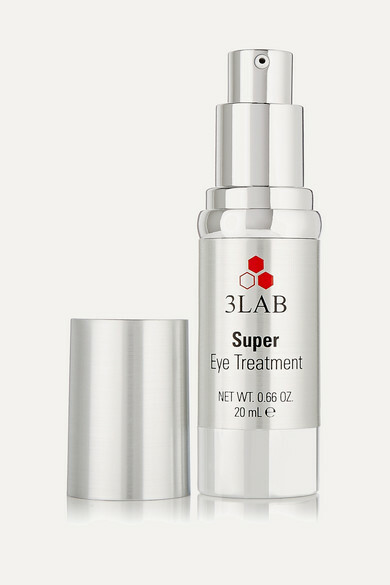 One of 3LAB's most-lauded products, this Super Eye Treatment is designed to lift and firm the sensitive areas around the eyes and reduce darkness and puffiness. 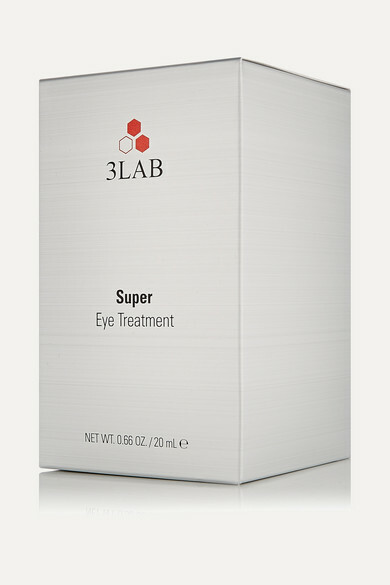 Formulated with a potent blend of stem cell activators, peptide blends and natural plant extracts, it effectively rejuvenates and repairs skin tissue at a base level.